ATI understands that it can be just as important to have precise, high-tech management capabilities on your industrial/commercial burners as to have the burners themselves. 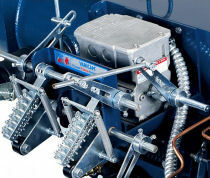 We, therefore, have chosen to connect our clients with the Power Flame line of burner management and fuel control systems, which have proven themselves superior in the industry over many years of reliable service. This is the standard model of Director, and it brings you high-quality graphics displays of numerous critical burner functions at a competitive price. Director is an eight-color display system that uses light-up, intuitive graphics that resemble the system features they represent. This system includes all of the features of Director Management but adds indicators for high/low water limits, air-flow failures, pilot light failure, and more. Flashing lights/alarm bells make it easy to recognize a problem early, and lights flash in the order in which the failures occurred. The Director Supervisory Control System (SCS) combines a touch-screen management display with the Siemens LMV-5 Linkage-less burner control system. The Director SCS gathers, stores, and clearly displays pertinent data to ease burner/boiler management tasks and/or transmits data to a higher-level BMS. Power Flame's Varicam Fuel Metering System is a characterized cam-actuated, fuel-metering device that is highly and precisely adjustable to achieve the desired fuel-air ratio across your burner's full firing range. ​Varicam is specifically designed to satisfy the great sophistication in fuel-air ratio control that is needed for optimal use of modern burners. For transport of fuel and compressed air. With Simplex strainers, piping cross-over, and optional remote control capability. Capable of fuel transport for individual burners or multiple burners using a single fuel source. 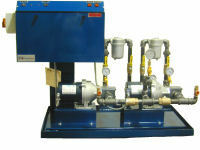 Functional on numerous light oil/gas-light oil combustion systems. Usable with air-atomizing combustion systems and standard for #6 oil applications. Custom-engineered to meet exacting coding, pressure drop, and flow requirements.